1. Put all the ingredients in a large saucepan with a pinch of salt. Cover and cook over a gentle heat, stirring until the sugar has dissolved – about 5 minutes. 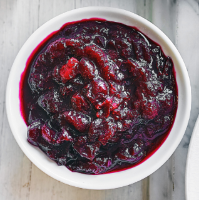 Turn up the heat and simmer briskly for 8-10 minutes, stirring often, until the cranberries have just burst and the sauce has thickened to a loose-jam consistency. Remove the cinnamon stick and star anise before serving.